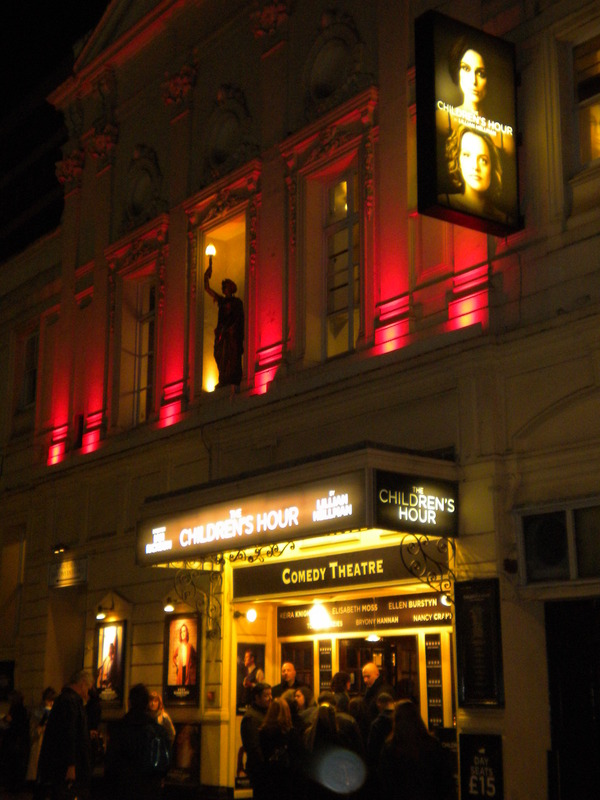 Lies and accusations fill the pot-boiler drama The Children’s Hour, now playing here in the West End theatre district of London at the Comedy Theatre. This Lillian Hellman play from 1934 has been brought out in a compelling revival that seems to be dividing and provoking audiences today as it did in its original premiere. Set in an all-girls school in 1930’s New England, one young student by the name of Mary (Bryony Hannah) harbors deep grudges against the two proprietors of the school. Attempting to get back at them, she maliciously spreads lies and tales throughout the school that the two are lesbian lovers. Shocked by the sordid scandal, the reaction from that period society and its prim-thinking town denizens rips the two women’s lives and reputation to shreds. Keira Knightley (The Pirates of the Caribbean, The Duchess) and Elisabeth Moss (“Mad Men”) star as the note-worthy and afflicted duo, Karen and Martha, respectively. Both women played up to their characters’ strength and brought out the maximum emotions that erupted during the fiery moments of the scandal. But it seemed there were two slightly contrasting styles happening between Knightley and Moss. Karen was the most level-headed and careful character that Knightley nicely displayed in a reserved key. But Martha, on the other hand, was a woman who isn’t afraid to let her vengeful side out. In Moss’ performance of her, she came out extremely strong-minded and loud, to the point of shrill yelling. As written by Hellman, the character had the sharpest and venomous dialogue in the entire play. Its sensitive subject matter of homosexuality may have contributed to the play being banned in the 1930’s, but I also believe that the strong spiteful writing may have been a part of it too. The direction provided by Ian Rickson (The Seagull, Hedda Gabler) was expertly handled for this heavy-handed drama in an enhanced production. The ensemble of school girls was quite fascinating to see in their initial silent interaction that opens the play. As it progresses, the peer dynamic then shifts into pettiness and juvenilia. For the two leads though, it seems as if Rickson has given free rein to both Knightley and Moss, but that’s a great advantage. It allows them room to feel and interpret their characters’ moods and actions more organically, rather than being mechanical as Hellman’s script tells them to do. This fiery revival’s subject is no longer taboo, but now drawing attention in better ways. Seeing it in a sociological and historical perspective, you can sense how major the discomfort was back in the 1930’s, especially in a female boarding school. The revival here in London has stirred audience interest and demand so much that it has warranted an extension until May, based on box office ticket sales. There is also talk of the play transferring to Broadway in the fall. If it does, however, I would advise my fellow statesman to spend some time with this Children’s Hour and experience it for yourself. Well written review. Have you taken on the roll of critic now? Sounds like you are enjoying your trip. I love the way you write Paul. It sounds like you are having a wonderful time. No trip is complete without a fiasco at the airport : ). The last time I was there with the kids we saw Joseph and the Amazing Technicolor Dreamcoat. Hah, have you seen that one? I don’t suppose you frequent too many musicals. As you know my taste is a bit different. If you get a chance, get over to Scotland.